Most of us wish to see microscopic things in our surrounding. 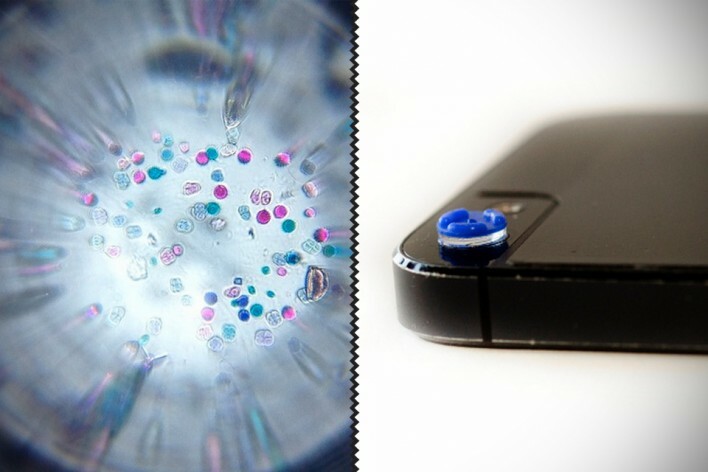 Can you imagine , you can turn your smart phone camera into microscope. Yes! it`s possible said by Thomas Larson. He post his project kickstarter.com . He just reached his pledged. The Micro Phone Lens 150x is the world’s first device that makes your phone or tablet comparable to a professional or laboratory microscope! This is the culmination of over two year’s worth of work, including the original Micro Phone Lens 15x. Your support will help to purchase precision optical tooling, making the Lens available to the world. At Home: Remember when you got your first microscope kit? Let’s get kids excited about science and exploring the world in a fun and modern way! In Schools: What if every student in a classroom had access to their own microscope? With the number of tablets (and cell phones) in modern schools, it could easily be possible. Enabling Research: A microscope so portable (and affordable) would enable scientific research where it wasn’t possible before. Out in the field, days from the nearest lab? Not a problem. And More: The applications of a microscope are myriad, including industrial inspections, water quality testing, and even identifying parasites and other harmful microorganisms. The 150x supplements conventional microscopes wherever cost, portability, or taking pictures is a concern. The Micro Phone Lens 150x was designed to achieve spectacular results with absolute simplicity. Powerful: At 150x magnification, the Lens is comparable to a conventional microscope. Universal: The 150x works with any device with a 5 Megapixel or greater camera. This includes all smart phones, tablets, and even newer iPods. Durable: Made from a pliable, platinum-catalyzed polymer, the Lens is scratch-proof and durable. Stick-On: The Lens self-adheres directly to your device’s camera. Just stick right on, and put away when done! This feature is so cool it demands its own section. Focus your image by gently pressing on the microscope slide. It’s easy and intuitive; it makes adjusting the position of the slide by a few micrometers effortless. It works whether you have your device flat on a table (tablet or front phone camera), or are holding it in your hands (main phone camera). Larson believes his creation can help get microscopes in the hands of students and schools everywhere. After all, since more and more kids have smartphones, why shouldn’t more and more kids have microscopes as well? His Kickstarter has already exceeded its original goal of $50,000. Here’s a bonus – if you pledge just $29 you can still get your own lens.